Prik nam blah (พริกน้ำปลา) is about as ordinary on a Thailand dining tables as is a bottle of ketchup or mustard at any good hot dog stand. Fortunately it's quite a bit easier to make than those western condiments. 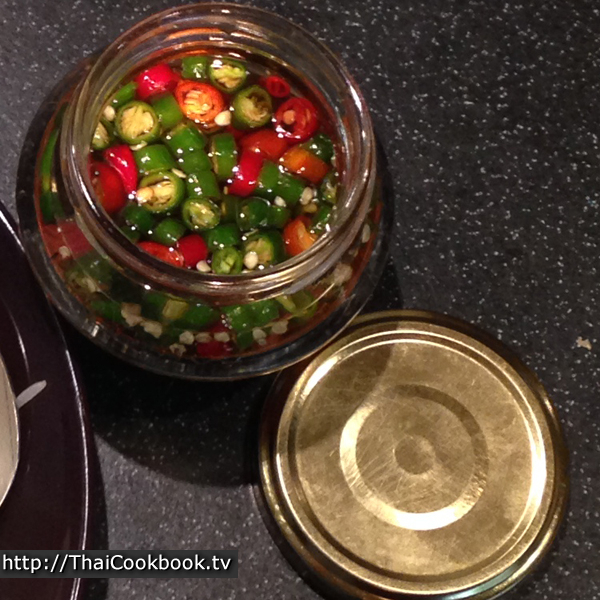 Just a little high-quality fish sauce and some of the good, very hot, Thai chilies that we call Prik Kee Nu. There are actually 2 types of chili that we use. 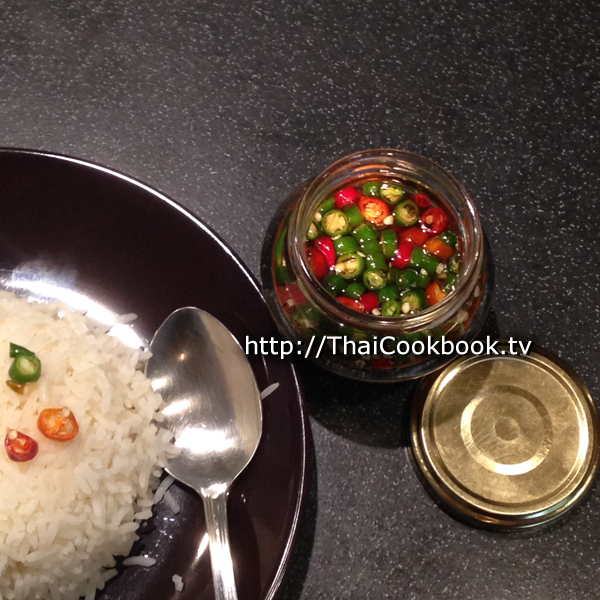 The smaller variety called Prik Kee Nu Suan are so spicy that even most Thais don't eat them. Here we use the longer ones. But they are far from mild. What's in our Fish Sauce with Hot Chilies. 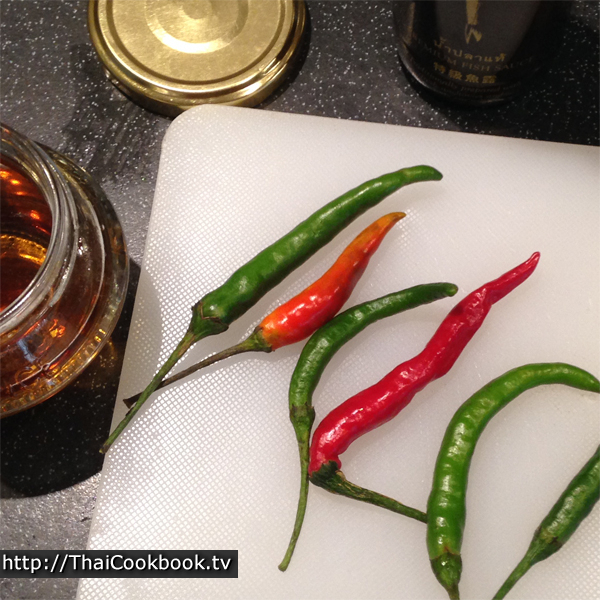 How we make our Fish Sauce with Hot Chilies. 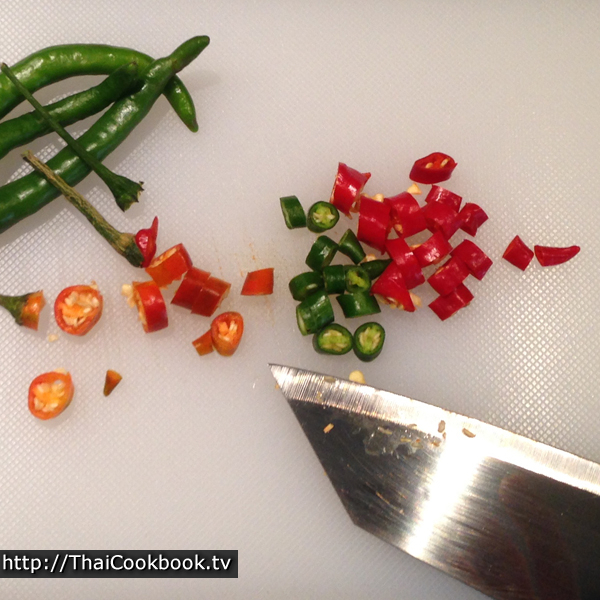 1) Cut a few red and green Thai hot chilies into neat little slices. Stir them into a quality Thai fish sauce and let them marinate for about an hour. 2) Keep refrigerated in a tightly closed container, but always serve at room temperature. Select a good, high quality fish sauce, from Thailand, for making Prik Nam Blah. I like to use chilies from green to red in color so it looks pretty, but it is more common to see this with the unripened green ones. The red ones are perceived to be hotter, but in fact they are all very hot anyway, so why not make it look nice. Put the fish sauce in a glass container with a lid. Cut the chilies straight across in 1/8 - 1/4 inch slices. Add them to the fish sauce and stir. Let sit for about an hour so the 2 flavors can mix a little. Serve at room temperature, but if you are using it often and want to keep some on hand, it will keep in your refrigerator for several days. I like to use a jar with a tight fitting lid.